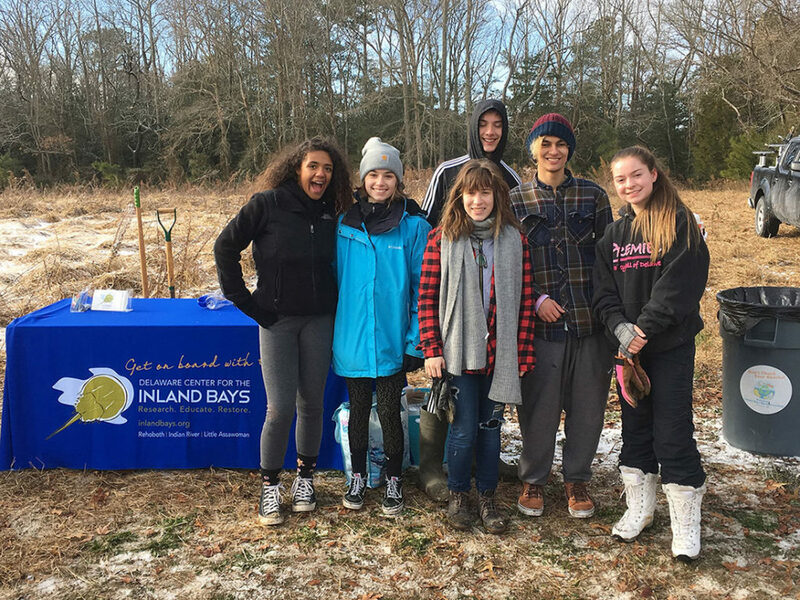 Lewes, DE – Between December 14 and 16, over 90 volunteers joined the Delaware Center for the Inland Bays to plant trees at the Perry Tract of the Angola Neck Preserve, located between Lewes and Millsboro. 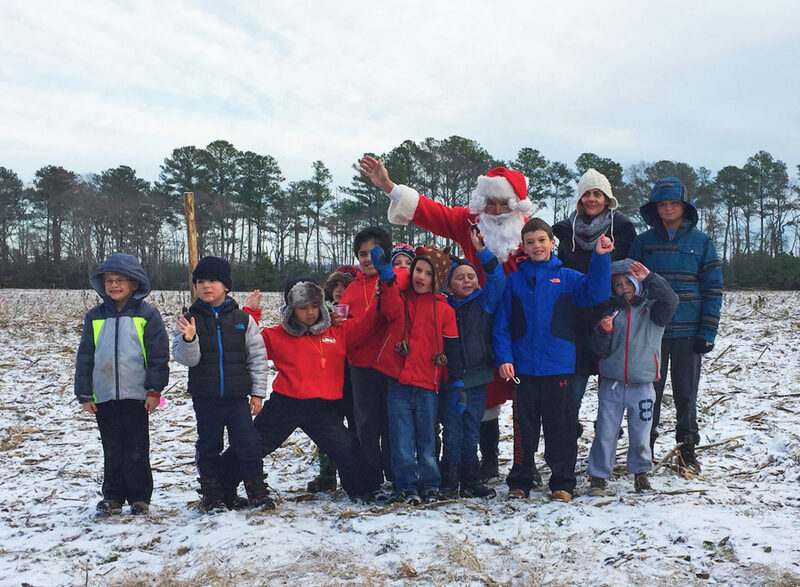 Among those that participated were Center volunteers, the Lion Den of Lewes’ Cub Scout Pack 1, students from Cape High School’s “Cape for Tomorrow” environmental club, and even Santa Claus himself! The combined efforts of these speedy volunteers made this year’s planting a breeze, with just under 12,000 plants arranged on 12 acres of land. This year’s seedlings consisted of a mix of northern bayberry, beach plum, willow oak, hazel alder, and pitch pine – all species that are native to the Inland Bays watershed. This year’s planting was the final phase of a four-year project that converts 36 total acres to forested land. This Perry Tract is particularly important because of its proximity to Rehoboth Bay and the Cherry Walk Creek tributary. 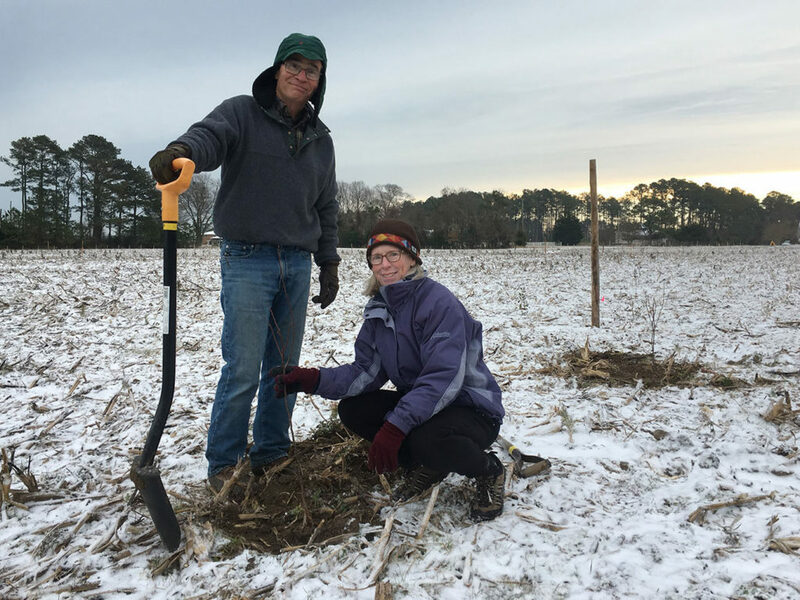 The planting of this former agricultural land will prevent almost 200 pounds of nutrient pollution from reaching the Inland Bays each year, and will create important feeding and nesting habitat for migratory birds for years to come! Members of Cape Henlopen High School’s “CAPE for Tomorrow” club pose after their morning planting shift! The Center would like to extend a sincere thank you to everyone who attended this event, shared the word, and supported this year’s Holiday Planting. Happy Holidays from your friends at the Delaware Center for the Inland Bays! The Delaware Center for the Inland Bays is a non-profit organization established in 1994, and is one of 28 National Estuary Programs. With its many partners, the CIB works to preserve, protect and restore Delaware’s Inland Bays–the water that flows into them, and the watershed around them. For more information call Katie Young at (302) 226-8105 x 109, send an email to communications@inlandbays.org , or visit us online at www.inlandbays.org. This entry was posted in PRESS RELEASE and tagged habitat, holiday, nutrient pollution, reforestation, trees. Bookmark the permalink.